As we gradually head towards Christmas I wanted to share with you the different Christmas themed smurfs Schleich released. These were originally sold as a counter display carton, with the article number 20833. What is interesting is to see the number of smurfs increase each year, which goes to show how popular they were. 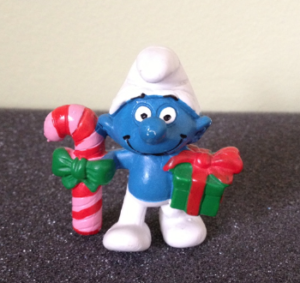 In the first year – 1983 only two smurfs were released, Santa #20124 and Santa Smurfette #20153. Santa is wearing a red jacket with a yellow belt, white pants, a red hat with a white pom pom while carrying a sack of toys including a doll. Depending where Santa was painted will determine the colour of the pom pom on the hat and also the colour of the doll’s face. Santa Smurfette is wearing a long hooded red coat with a white trim, while holding a large rectangle shaped present with a red ribbon around it. In the second year – 1984 two more smurfs added. This included Christmas Smurf #20207 and Christmas Smurfette #20208. Christmas Smurf is also referred to as Christmas Candy & Gift which really isn’t surprising as the smurf is carrying a big candy cane and a green present wrapped in a red ribbon. Christmas Smurfette is wearing a short red coat with a white trim while holding a square shaped present with a red ribbon around it. 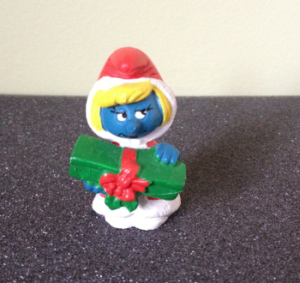 In my opinion out of all the Christmas themed smurfs these two are the hardest to find. 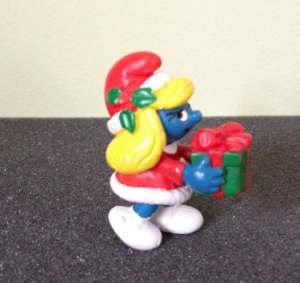 By the third and the fourth year – 1985/1986 Schleich introduced two other Christmas themed smurfs, Christmas Smurfette #20200 and Christmas with Lantern #20201. This Christmas Smurfette is wearing a long green coat while holding out in front of her a white rectangle shaped present with a thin red ribbon. Christmas with Lantern can be found wearing a light brown jacket with a white trim and matching brown hat with Christmas Holly attached to the side. In his right hand he is holding a green square shaped present with a red ribbon and a red & yellow lantern in his left hand. 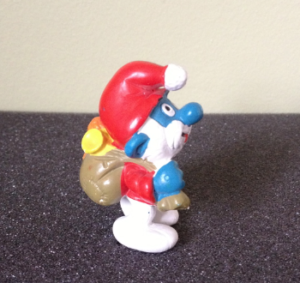 The next time we see the six Christmas themed smurfs is in the 1990 Schleich catalogue. This may have something to do with Schleich declaring bankruptcy in the beginning of 1987. When thinking of Christmas smurfs most people think only of the ones with a gold cord. 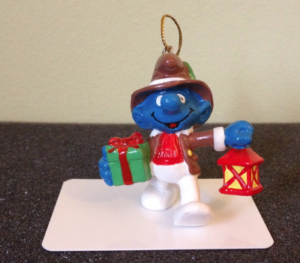 Most collector’s sites will display these Christmas smurfs in their own section, where as the Schleich Christmas smurfs are just listed with their other smurfs. 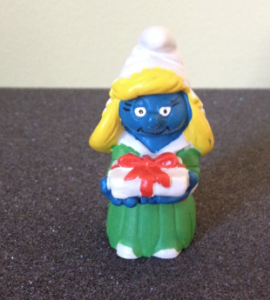 This may explain why some of these Christmas themed smurfs are considered rarer and are harder to find.